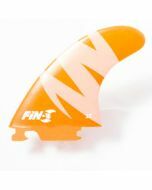 The Fin-S S3 fin template is an excellent thruster fin set for smaller surfers or groms in all conditions. The S-Series fins were developed and tested by Fin-S. All of the S-Series line of fins contain the unique translucent Fin-S spring graphic on the side fins. It's subtle, yet a clean new look on the fins. This fin set also includes the durable Fin-S neoprene carrying case. This will keep your fins organized and protected while not in use and during travel.